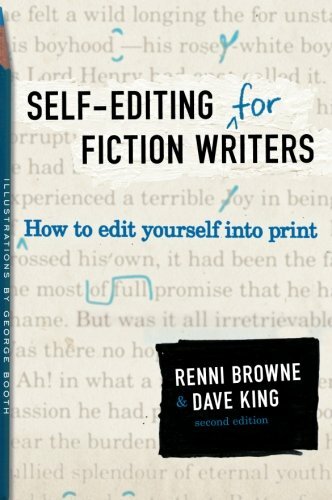 I picked up Self-Editing for Fiction Writers by editors Renni Browne and Dave King because several of my editing colleagues recommended it as a solid resource for authors. There are many books on how to write and comparatively few on how to edit your own writing. Yet this is such a critical task for writers if they want to submit a solid manuscript for further editing or publishing. I was really looking forward to reading through this book, and I’m glad to say it was a winner. Self-Editing for Fiction Writers is focused on the details of stylistic editing. The authors assume that you have already dealt with the larger structural concerns of plot, character arc, and theme. The book covers a broad range of topics relating to the mechanics of editing: showing vs. telling, characterization and exposition, point of view, proportion, dialogue, interior monologue, sound and voice, repetition, and scene beats and breaks. I mentioned that a lot of topics were covered in this book. Each of them are discussed in a great amount of depth without becoming overwhelming. The authors cover several angles and explain why certain situations require different treatment from others. I particularly enjoyed the chapter, “Show and Tell,” which brings new life to the old chestnut that you should be showing something to the readers rather than telling them about it. All writers receive this advice at some point, but Browne and King bring a balanced perspective to the discussion, clearly illustrating when to use show and when to use tell. The writing style is clear and engaging, and avoids the lecturing style that sometimes happens with “how to” books. Editors have a somewhat unfair reputation as nitpicking sticklers, and I’m happy to say there is no sign of that here — instead, the authors are positive and supportive as they outline the issues that writers often struggle with and potential solutions. Plenty of examples are used in each chapter to illustrate the points, and at the end of each chapter there are useful checklists as well as practice exercises. This book is so well-written that it was difficult to find any issues with it. However, as we writers know, there’s always something that can be improved! Most of the examples in the book are bracketed with detailed explanations of what the examples are illustrating. Once in a while, though, an example is thrown out where the authors assume that the reader will identify what is right or wrong with the passage without help. One place that stood out for me was in the chapter on “Voice,” where the authors provide an example of five different character monologues from the same book and say, “Every voice is distinct.” How they are distinct is never explained, and I feel this weakens the helpfulness of this example. My only other wish is that the book contained even more practical exercises. There are usually about three per chapter, and having more (and shorter) exercises would make this resource even more valuable. My favourite part of this book is not a particular moment but an overall thread that gets woven throughout the narrative. There is a lot of focus in the book on how to bring out characters and their emotions. The authors discuss several areas where these can be displayed, such as through dialogue, interior monologue, and exposition from the character’s point of view. They also talk about how character development can be combined with the advancement of plot, the establishment of setting, and the revelation of key information. This is the best book I have ever read on how to edit your own writing. Pick it up, read it, and read it again. You won’t regret it. If you are interested in reading about other writing resources, you may want to take a look at my Resources page. And if you’re looking for more tips on self-editing, I have recently written a post on why you should try a style sheet when editing your work. What do you find is the most challenging aspect of self-editing? Which resources have helped you with this difficult task? I read this book years ago before I really knew what I was doing (assuming I do now…), but your great review has spurred me to read it again. I’ve been meaning to, figuring I missed things the first time around since I was such a newbie. Thanks for steering me there. It’s nice to already have the book on my shelf! Hmmm…do we ever know what we’re doing, really? 😉 That’s great that you already have it. I have the same experience of re-reading books and noticing new things because I’m at a different stage. As I was reading this I was thinking about how many nuggets are in it and how I can see myself reading it regularly as I continue to edit. I read this when I edited my first book and found it invaluable. Like Carrie, you’ve made me want to go back and revisit it. Thank you, this sounds very useful! I strongly believe that editing others’ work is the best way to learn about editing your own. Hi, Eric! It’s great to see you. I agree – the more practice you can get, the better. That’s why I wish there were a few more exercises in this book. However, the ones they do have involve editing passages from others’ work (rather than picking something of your own, as these books sometimes do), which works really well. Great Post – interesting find. So often I see books on “How To Write This” and “How To Create That” but never hoped to find one on th Art of Editing – aiming to check it out soon! U may be excited to learn that to celebrate my 75th Post, I’ve finally loaded some of MY OWN fiction! On my blog Doorway Between Worlds I regularly review writing resources that I believe would be helpful for my readers. I’m sharing this one here since it’s focused on the art of self-editing. FAVORITE EDITING BOOK EVER! I love this book. I have used it nearly daily when going through a serious editing phase of a manuscript–usually right before I had it over to my first run with my long-time critique partner, who then rips it apart and tells me how much I missed from the book. Still, I learn more from this book with each thumb through it. I often find that how-to books about the crafts of writing are kind of superficial and not very insightful, at least not if you already have some experience with the craft. Yes, unfortunately some of those how-to books are seemingly more focused on making money than providing value to the writer! I only highlight the best of the bunch here. 🙂 If you read it, I’d love to hear what you think! I’m another one who’s been inspired to revisit this book by your post. It’s the only book I have specifically dedicated to editing, and a good one, but I keep forgetting to refer to it when doing edits. Thanks for the reminder! You’re welcome! It’s fascinating to see how many DBW readers have already read this. Makes me think there is a good market out there for editing books! This book looks really familiar. I have to go back to my shelves and see if I have it or if I read it at the library or some other place. And thanks for reminding me to get you that list of names and places for the style sheet. I’d forgotten about it. If I don’t write things down, they go right out of my head. Very helpful. As you said, there’s lots of advice on creating the draft. Some is helpful, but the first draft is not where I need help. I like the Renni Browne book, and your website is VERY helpful in other aspects of writing. Thanks for commenting, John. Welcome to DBW! I’m so glad you find my site helpful. I love the Browne book because it has just the right level of detail for writers who are looking to refine their craft. And thank you for the reblog, I appreciate it! My prior post leaned heavily on Brown and King, Self-Editing for Fiction Writers. Here’s a nice review from a website with much valuable advice on writing from an editor.